The American Angus Association held its 132nd Annual Meeting Nov. 5, in conjunction with the 2015 National Angus Convention & Trade Show, in Overland Park, Kan. Delegates elected as new members to the organization's Board of Directors, from left, are: Chuck Grove, Forest, Va.; Mike McCravy, Bowdon, Ga.; James Coffey, Hustonville, Ky.; Don Schiefelbein, Kimball, Minn.; and Mick Varilek, Geddes, S.D. Photo by Leann Schleicher, Angus Media. The American Angus Association® announced new members and officers elected to its Board of Directors during the 132nd Annual Convention of Delegates in Overland Park, Kan. Those serving the Association for three-year terms are: James Coffey of Hustonville, Kentucky; Chuck Grove of Forest, Virginia; Mike McCravy of Bowdon, Georgia; Don Schiefelbein of Kimball, Minnesota; and Mick Varilek of Geddes, South Dakota. Jim Sitz, Dillon, Montana, was elected the new Association president and chairman of the Board of Directors. He succeeds Steve Olson, Hereford, Texas. Jim operates Sitz Angus Ranch near Dillon, Mont., which has been a family tradition since 1928. He and his wife, Tammi, have four children: Amber, Ashley, Tyler and Tucker. Charlie Boyd, Mays Lick, Kentucky, was elected by delegates to serve as Association vice president and vice chairman of the Board of Directors. A family-owned seedstock business, Charlie and his wife, Paula, their two sons operate Boyd Beef Cattle in northern Kentucky. His sons, Blake and Logan, represent the operation’s fifth generation. Kevin Yon, Ridge Spring, South Carolina, will serve as the 2015-2016 treasurer. First-generation Angus breeders, Kevin and his wife, Lydia, established Yon Family Farms in 1996. He has served as president of the South Carolina Angus Association and South Carolina Cattlemen’s Association. They have three children: Sally, Drake and Corbin. A total of 318 delegates from 44 states, Washington D.C., and Canada represented Association members during the Annual Convention of Delegates hosted during the 2015 Angus Means Business National Convention & Trade Show at the Overland Park Convention Center. More than 2,100 Angus breeders and commercial cattlemen attended the three-day event in Overland Park, Kan., and enjoyed educational sessions, a packed trade show, as well as fun and entertainment. 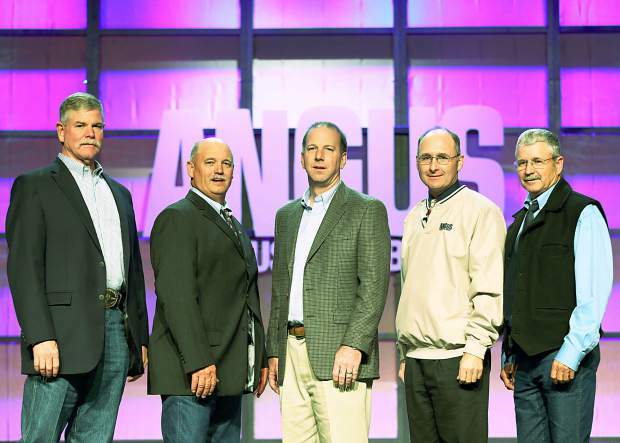 Read more about the American Angus Association’s new leaders below. James Coffey is a fifth-generation Angus breeder. Raised on his family’s cattle and tobacco operation, Branch View Angus, Coffey has spent his entire life working with the Angus breed. A graduate of the University of Kentucky in accounting, he worked for Coopers and Lybrand, Louisville, Ky., a Big Six accounting firm, then joined Kerbaugh and Rodes, CPAs, Danville, Ky., and finished his CPA certification. In 1993, he purchased Pitman Creek Wholesale, a regional sporting goods distributor. He has two sons, Addison and Bennett; and he and his wife, LuAnn, have a son, David Reid. Chuck Grove was raised on his family’s registered Angus farm in Forest, Virgnia. A life member of the American Angus Association since 1973, Grove served the American Angus Association as a regional manager for 39 years, covering Virginia, Maryland, West Virginia, Delaware and Ohio. He served as the regional manager representative to the American Angus Association Board of Directors for nine years and was the first Association staff advisor of the National Junior Angus Board (NJAB). He and his wife of 41 years, Ruth, have two children, Jake and Rachel, and two grandchildren. They live on the family farm, grazing 100 registered Angus cows. Don Schiefelbein was born and raised as the seventh of nine sons on his family’s Angus farm near Kimball, Minn. He graduated from Texas A&M University in College Station, Texas, with a degree in animal science. Following graduation during the depths of the farm crisis of the 1980s, he was unable to immediately return to the family farm. He made his career with the American Gelbvieh Association serving as executive director of the association. This will be Schiefelbein’s second term on the American Angus Association Board of Directors. He and his wife, Jennifer, have three daughters: Shelby, Abbey and Bailee. Mick Varilek is a lifelong Angus breeder and rancher from southern South Dakota. He met his wife, Lynn, while at South Dakota State University and after graduation returned to the family ranch where they raised three children. Their ranch is on the Missouri River. It currently consists of 3,000 acres of native pasture and 1,000 acres of grass hay, irrigated alfalfa and cropland. The ranch includes 500 registered Angus females that have been selected through genomic tests since 2010. Mick and his family have always been committed to raising top-quality Angus cattle. Mike McCravy established MM Cattle Co. with his wife, Christy, with 40 cows and a dream in 1999. Today’s operation consists of 125 registered Angus females along with a commercial cow herd situated in west-central Georgia. In addition to the cattle, Mike owns and operates a small custom hay business. 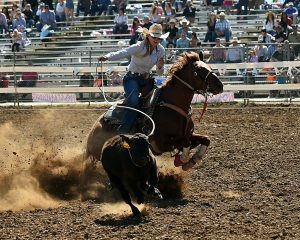 The McCravys, along with fellow area cattlemen, host an annual bull and commercial replacement female sale in November each year. Mike is retired after 25 years with the Douglas County Fire Department.